Recover IE passwords and logins to web sites. Remove supervisor password. Password Recovery Engine for Internet Explorer 1.2 is password managers software developed by Bimesoft. "Password Recovery Engine for Internet Explorer" (IEPRE) recovers logins and passwords to web sites and also deletes and restores the Internet Explorer Content Advisor password. The software has an easy-to-use interface. Just open the program IEPRE and you will see all logins and passwords to web sites stored on your computer. IEPRE recovers logins and passwords to sites for logon via web forms and via the HTTP or HTTPS protocol. This security & privacy software is shareware, which means you can download and use Password Recovery Engine for Internet Explorer 1.2 for free during the trial period (usually for 30 days). At the expiration of the period you will have to buy the password managers product for $29.95. Password Recovery Engine for Internet Explorer 1.2 is available at regnow and Bimesoft website. Password Recovery Engine for Internet Explorer 1.2 supports different languages (including English). It works with Windows 98/XP/Vista. 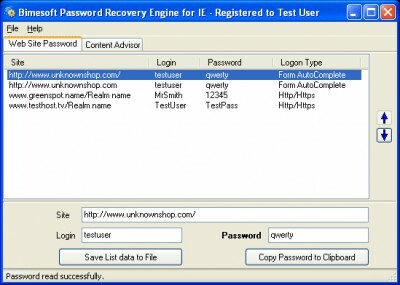 We have tested Password Recovery Engine for Internet Explorer 1.2 for spyware and adware modules. The software is absolutely safe to install. Our website has thoroughly tested security & privacy product Password Recovery Engine for Internet Explorer 1.2, written the review and uploaded installation file (649K) to our fast server. Downloading Password Recovery Engine for Internet Explorer 1.2 will take several seconds if you use fast ADSL connection. Automatically Login to Web Sites, Email, and Manage Web Site Logins, Passwords. SpotIE recovers passwords to web sites saved in Internet Explorer.